During the assembly of the custom MIDI pedalboard, I began to seek out some other samples and sounds of real pipe organs. It's much easier to produce the sounds of electronic organs, after all. The K2600 happens to do a remarkable emulation of that, for example. But the range of sounds is considerably more limited in the Hammond, Conn, Baldwin, and other early electronic instruments than in "the real thing." If cost and space played no role, it's likely that the earlier electronic organs would never have replaced so many pipe organs. I wanted to find both some good classical organ and theater organ ranks, as they're quite different. The former was more easily found. I discovered a few websites that distribute a fine collection which a small group of enterprising fans led by Micheil Post in Amsterdam have assembled, the Post Organ Toolkit (since the url has changed, just do a Google search on that name string, if you wish more info, or try this link, which was working recently). These are excellent, cleanly produced pipe rank sounds, from several lovely European instruments. A notable innovation is the inclusion of a folder's worth of resynthesis samples. These are based on actual high res samples, but since they're created via Fourier Series summations have less noise and are very uniform. They loop easily, and combine into a multinote keymap much more easily than most samples, and sound terrific, imho. Anyway, after the pedalboard was operating with the 2600 I began the slow work of assembling a whole library of pipe sounds pruned and edited from these good resources. The only flaw I found is that all samples were recorded at an unnecessary low level, but you can adjust for that and resave better versions (losing only some s/n). When you start stacking these ranks you can create some pretty incredible and highly realistic emulations. I'd be hard pressed to guess they'd not been recorded in an actual concert hall or cathedral, given some better quality reverb and ambience on the output. At this time I discovered how to convert some of these "straight-organ" sounds into more orchestral organ versions. 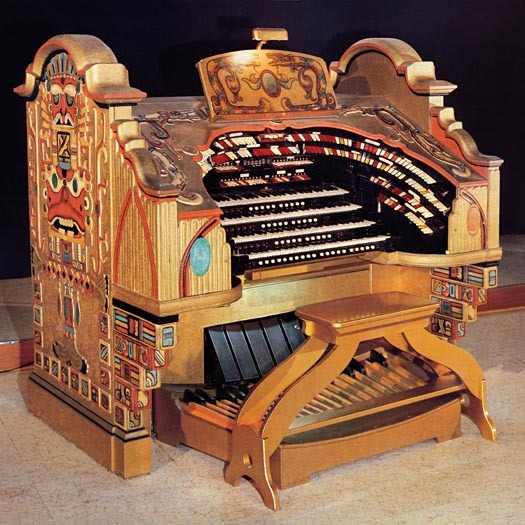 I'm fond of both kinds of organ styles and timbres, the starker classic and more orchestral cinema. Since real orchestras use a tasteful amount of vibrato on nearly all instruments (not clarinet or percs or harp, of course...), that has to be added. Real pipe organs use a tremulant box on the wind supplies to each chest to accomplish this. With properly voiced pipes not only will the amplitude vary with the swing of pressure, but the spectrum and more important, the pitch will, too. 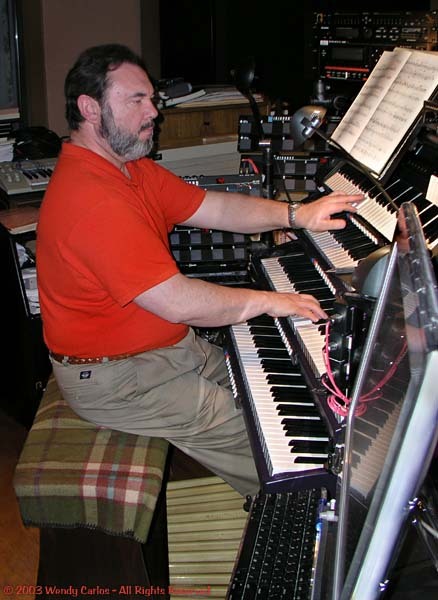 It's a complex interaction, which Kurzweil's VAST synth tools is well adaptable to handling. As long as the variations are linear, within certain bounds, you can come up with a pretty impressive trem version of many of the ranks in the Post Toolkit. But still these are not the same as what the big old cinema organs could do at the drop of a stop tab. Sometimes the organists even forgot to turn the trems off now and then -- for variety's sake! But like it or leave it alone, as with the big rotating speakers Don Leslie came up with for the formerly dullish Hammond organ sound, this mild undulation is an idiosyncratic part of the timbre of an orchestral style pipe organ. Now where to get some of "the real thing"? I checked around for weeks, and started to think that there was nothing out there. One exception was that the same people who put together the Organ Toolkit had recently added a sample collection from a large Dutch theater organ that was 2/3rds still operating. Unfortunately Dutch pipe organs tend to be a bit mellow, something rather different from a real WurliTzer in its prime. Eventually I discovered that Artisan Organs (a firm which I had come within a hair's breadth of working with shortly before becoming involved with Bob Moog's early synthesizer) was still in business. Yeay! They now manufacture modular retrofit equipment for both pipe and electronic organs, flexible systems to "Midify" your older instruments, add powerful new features. They also were in the process of launching something quite kewl. It's called "Ranks in a Box", and means just that: a small cabinet which when fed by MIDI can reproduce the sounds of a decent pipe organ, either classical or theater styles. THAT sounded interesting! The Artisan Instruments website (recently expanded with many impressive new products and demonstrations) listed many of the rank or stop names, and it brought many of my oldest memories flooding back, when for a short time I actually knew something about these old endearing contraptions that could do so much from modest means. I read the list: Tuba Horn, Bombarde, Brass Trumpet, Brass Saxophone, Concert Flute, Horn Diapason, Solo String, Kinura, Vox Humana, to say nothing of the all important Tibia Clausa... My jaw must have dropped open a bit. Time to send off a letter, spelling out what I was looking for. I got an immediate reply from Red Carlson, who cheerfully and most generously offered to help in any way he could. Included in their company literature and catalog, was a photo of this then-new (their newest devices are even more remarkable) elegant device, called: "Ranks in a Box" (RIAB). If I were an organist, and not so interested in sound design and creating my own tools and timbre paradigms, I'd have adopted this clever, modestly priced device right off (Clark's company, Allen, makes an even smaller MIDI pipe rank box, BTW). I'd recommend it to any of you with that focus. But now that I had my first K2600, and was spending long days and nights on it getting my chops and sound design skills back, I was not about to abandon those to a more conventional approach (see, I told you I'm crazy). It was a little bit like history repeating itself again, as I missed out once more on becoming an Artisan organ owner (I'm sorry, Red), but instead took a small step sideways. Long story short, Red introduced me to Artisan co-owner, Mark Andersen. 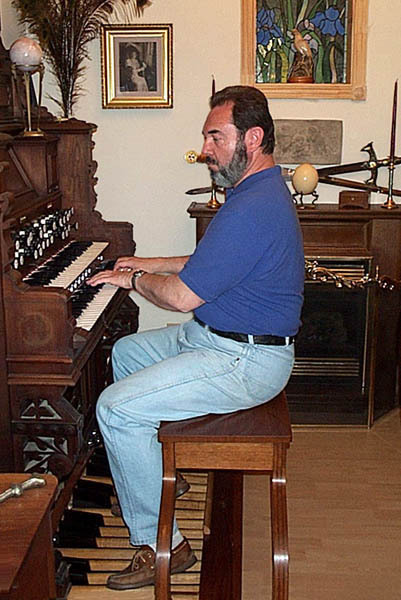 He's also the brains behind their marvelous collection of actual pipe organ ranks, and has built some gorgeous instruments in his upstate NY home. Too bad he no longer lives in NYC, or he'd have to shoo me away from his front door! But we used the phone and e-mail often, and have now become friends. He turned out also to be a longtime fan of mine. And when he learned what I was concocting here, he also offered to help. 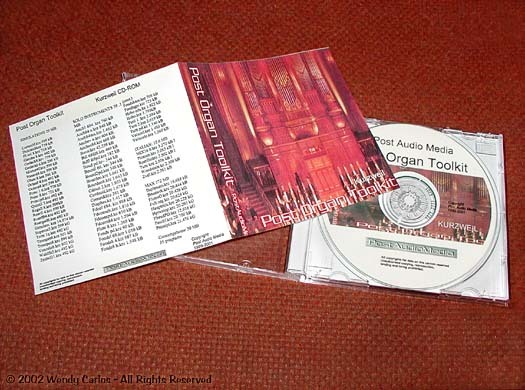 We traded CD's, as I also did with Red, and got to hear their effective demonstration of all kinds of organ sound they have made available. And before I could add anything further, I ended up with a collection of Mark's wunnerful WurliTzer and other TO samples. It's a meticulous set, years of care and experience in the making, and provided exactly the missing ingredient that this slowly growing new instrument needed. To the left below is a recent photo of Mark performing on one of his restored antique instruments. The next photo is even more recent, and shows Mark in my studio (during our first f2f visit, in fact!) trying out the Wurly II, which you're going to watch grow from the ground up next. Mark's rather similar to me, similar to a lot of us in the synth world, a fully hybrid person, combining both tech and artistic skills and interests. He's also a formidable performer, an inspiration to an "adult beginner" like I've become (at least in this part of music making). It turns out that Mark is about as obsessive as I am about musical sounds. The TLC shows up all the time in working with the full collection. Like most creative enterprises, it's nowhere near as easy as it appears from without. Mark also is a formidable C++ computer programmer. While I'm using the new instrument for other purposes than just emulating pipe organs of sundry kinds, I will admit getting a HUGE kick out of being able to produce myself some of the sounds which I heard during my adolescence, and which inspired my career. I've adapted Mark's samples to the Kurzweil units. But after getting them to replicate the sounds of real pipes, I had to go further. 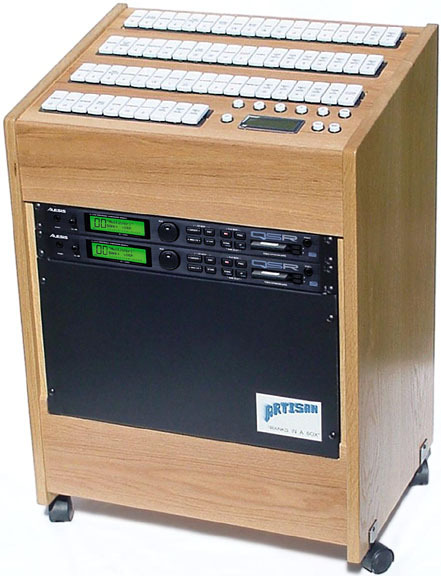 Now the new library of organ sounds includes much more than just a sampler would produce. There are large and subtle manipulations in the library, takeoffs from the old into the new, and all the trappings I've grown to love about the world of synthesis. It's different in other ways, too. An organ's manuals and pedals are like those on a harpsichord: non touch sensitive. Hit 'em hard, hit 'em soft, you get the same result. I'm too "corrupted" by other instruments to be satisfied with that. So the new library is a fully velocity and aftertouch responsive pipe organ collection. As you'll see below, there are compromises, like the lack of stop tabs, a certain bulkiness and homemade quality. But I'm greatly enjoying participating in several innovations which might be of value to help bring the organ into the new century. Oh -- about the photo to the right of the two of Mark. That's the venerable, unusually gorgeous Detroit Senate (formerly Fischer) WurliTzer, in all it's Mayan splendor. Lordy, what a console! Many aficionados believe this to be one of the 3 or 4 outstanding installations by the Rudolph Wurlitzer Company, produced in the late '20s, at the height of their powers. I noted that the majority of Mark's TO rank samples came from this instrument, plus several other respected instruments still playing in the NE states, none too far from where they were originally assembled, in North Tonawanda, NY. I'm most fortunate to have access to such definitive representations of the mature art of pipe organ design, voicing and innovation. You can begin to see why the logo at the top seemed justified. This is very much as if a whole family of musical instruments of nearly a century ago were being merged with the current state of the art, and why the name, "WurliTzer II," makes perfect sense. Fine, here's a functioning new instrument, with a working MIDI Pedalboard, the start of a full library of pipe sounds, to add to all the other acoustic instruments and exotic digital synth creations. Time to put it together into something a little more playable and lasting than piles of stuff precariously stacked in a corner. When the studio finally became organized, it was largely as I became adept at noodling together components from Ultimate Support Systems. Once you get the hang of it, know what bits to order for what purpose, it's a great way to cobble something together that is sturdy and flexible. Since the section of my studio where this was heading is far too small for a work space, I took over the kitchen / dining area. For nearly two months this is what it looked like, furniture and messy boxes and parts moved around to make room for tinker toying with the Thinker Toy handy dandy construction set (parental guidance suggested...)! Here we go then, collapsing the weeks into one web page. First I opened up the uncut tubing box, took out several five foot lengths. With some of the most useful component, the T-Fittings, and two leg kits these were roughed out into a promising simple right angle assembly, seen left above. There are two angled braces, as I worried that such a lot of eventual weight might be slightly wobbly. This is what sat here at the end of the first session. A few feet away I put together the parts for the first tier, mounting the brackets on a horizontal, which went directly on two more uprights. These would become the front corners of the rig. The third view shows that section mounted into the Step One parts, everything fastened together tightly. It was very solid and promising. Now it was a straightforward matter to prefab the second tier, the first of the tiers which could pivot on a horizontal axis. That was an idea I'd sketched out in pencil first -- a way to move upper units up and away so one could reach and work on the front panel controls of lower units. When you were done with editing and creating new sounds, you'd just swing everything back down again to perform -- at least that was the idea. Since the assembly was growing rather bulky at this stage, I was grateful for the help of musician Clare Cooper, who spent many hours assisting me in the next stage of assembly. You may recall that Clare had been part of the "Bach at the Beacon" concert several years ago, and also worked with me on the "Woundings" filmscore the following year. Need not say we've become close friends. It made this part of the job more fun to work together. We'd place a couple of 2600's in temporary position, try it out for size and spacing, note the problems, then take them off again for "creative modifications." There would have to be some kind of lower rear shelf to support the expression pedals, to protect the open rear of the pedalboard, perhaps serve other eventual functions, too. So step two, seen here from the rear (the stand has been rotated around 180 degrees for this stage), took this form. While I was working at that addition I found it hard to assemble parts down at floor level. No problem, I hoisted the whole thing, which was still pretty light for its size and strength, into an upside down position, as you see to the right above. Much better. Other questions came up. So where could the hard drives mount? How about on two small shelves below and to each side? Fine. And let's get a third tier up there. Here's a side view, back in non-inverted position, as the support stand was definitely taking shape. At about this time I had the brainstorm: "No, don't build another separate stand for the computer -- put it all together as a part of the main stand!" Um, right, uh -- would that work? I spent a day trying variations of the idea. Eventually, as you can see in the center above, I'd ended up with this ugly prototype, a swinging shelf which could handily support the flat panel monitor and both keyboard and trackball (for large monitors a mouse is clumsy, imho, and a trackball, once you learn how to use it, is a much faster pointing tool). Moving right along, it was time to check out the mounting of the synths. My singularly generous, super bright friends, John and Mike, are long-time supporters of the arts, and in particular often help artists they know who use computers. Over several years they've provided me with the Mac equipment I've been using for new music and the ongoing remastering of CD's for ESD. Has taken me some effort to allow their thoughtful assistance -- my Yankee upbringing doesn't accept favors or gifts (nor praise) easily. Last summer they heard about and offered to help on this new project, if I wouldn't mind (see what I mean? Singular). They decided to set me up not with another general purpose computer, but with two more K2600 music computers. Since these were becoming quite scarce (discontinued by Kurzweil? ), and since the K3000 appears to have been dropped from the company plans (nutz), I'd have had to find a way to get a second unit, if for no more than BU during deadlines. Then I could use the old SY77 as a third keyboard controller, along with the existing K2000s. But John and Mike changed that idea. Instead I was now surprised to have three K2600S's with which to build Wurly II. Wow! This model has the 76-note keyboards which feel so good to play. The 88-note piano keys of a 2600X would have been lovely, too. But that model is much larger and very much heavier than this one. Don't have the space, nor the muscles for it. Let's see, the original 61-note K2000S could sit up at the top, where the Solo manual of an organ would be located. To the left above you can see how the upper three synths are mounted with the black support tubing just below the center of mass. You have to angle each of the support bars slightly to achieve that positioning. So each synth is bistable, and will gladly sit either all the way forward, or similarly backwards, with little friction needed to hold it in either place. So how to assure that the spacing is consistent, and that nothing crashes one into the another, or topples over backwards? I ended up using some firm dark gray foam which was originally ordered to fill in the spaces around the new bedroom a/c. The installers had been sloppy, and left some gaping holes (you have to watch EVERYthing... don't you know?). The soft cheapo foam they returned and stuffed in the gaps was not going to last past one UGH (that's: "Urethane to Goo Half-life ", measured in cubic cm of treesap per fortnight squared. Think I'm just being silly? Read about urethane in tape binders HERE. Horrible stuff.). The new material, from a supplier of construction parts for canoes and kayaks (I'm not making this up), was a pretty neat closed cell vinyl material. After learning how to cut it (with a sharp bread knife), and then how to sand it smooth and neat, I decided to try to hack out some custom rubber bumpers, which would also act as spacers between each synth. You can see one of them in the center photo above, attached to the underside of a slightly angled support bar. This has turned out to be an ideal solution, now that I've been using it for a couple of months. The synths tilt repeatedly and smoothly in either direction, and what might have been a horror tale looks more as if it had been designed this way all along (yes, I test everything in a wind tunnel after using a new "simply fab-gear" CAD program... ;^). Now you know. Proves it's wise to stick with a decent idea, turn it into a great idea. To the right of that photo you can see the similarly improvised lower rear shelf, with a simple black backboard I slid in place. It makes it look much neater that way, and keeps items on the shelf from slipping off the back by accident. Here you can also see two expression pedals, and three trigger pedals, which can be changed around, configured in many ways. Those two pairs of side shelves also came out rather well. I used more of the same plastic laminate shelf material from the high priced but convenient neighborhood lumber store, just as I'd done a dozen years ago for the computer table you can see in some of the first photos way above, and other places in our website. The side shelves worked out just as stylishly. The left pair support four of the several SCSI Hard drives (and a small removable BU drive) that store all the files for the synths (there's a fifth HD not visible here). The right shelves handle both the power strips and most of the MIDI boxes which were needed to obtain some of the interconnection functions between synths, simply and easily. Yes, there are wires all around, mostly cabled, and far from messy, so it's actually quite easy to trace down problems, or make modifications at any time. Having an up-to-date schematic diagram is another big help. I'll add the latest diagram FYI later on. There was some grief trying to dope out where to mount the rack units. First came the rack K2000R, now configured as a "slave" to the keyboard K2000S -- the pair effectively acts like a fourth 2600 (same polyphony, anyway). Some other rack mount essentials are: a simple mixer, reverb, a MotU MidiTimepiece that would tie the new G4 to the rig, and so on. Here you can see that the final solution was to mount all of these up at the top, at a modest angle to the front. It's convenient, and doesn't look bad. While these are supported on the tall rear vertical tubes, the front uprights were just getting in the way. So I measured and cut them down. At the top of each sits a mount for one of the two bright halogen lights that illuminate the music rack. Actually that's an Ultimate Support sturdy plastic shelf, but the size was right, and with some foam rubber edging inside the lip, it makes a comfortable music rack. It's pivoted, too, like the synths beneath it. You'll see how they tilt in the next section.